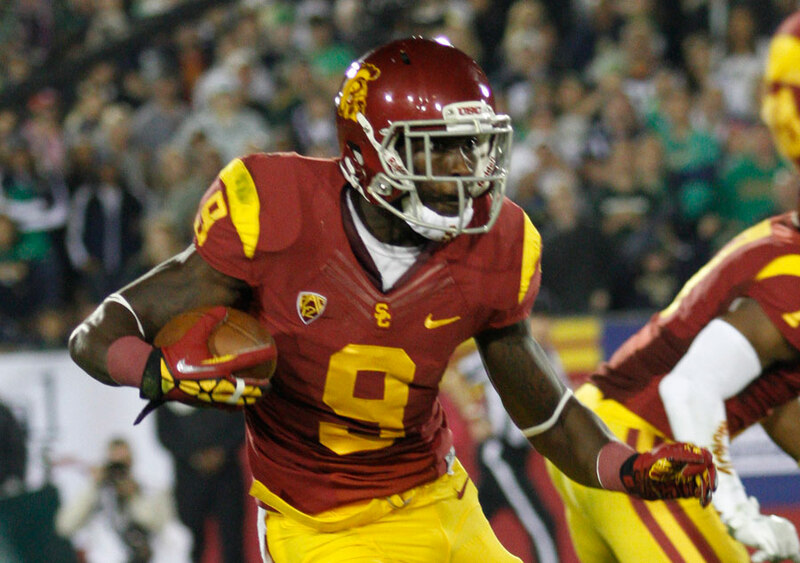 USC sophomore wide receiver Marqise Lee was the recipient of two major accolades Wednesday, as he was named a first team All-American by the American Football Coaches Association and a finalist for the 2012 Walter Camp Player of the Year Award. Lee joins Kansas State senior quarterback Collin Klein, Texas A&M freshman quarterback Johnny Manziel, Oregon senior running back Kenjon Barner and Notre Dame senior linebacker Manti Te’o as a Walter Camp Award finalist. He finished the 2012 regular season with 1,680 receiving yards and 14 total touchdowns. He also led the Football Bowl Subdivision with 112 receptions (a Pac-12 record) and was third in all-purpose yards at 215.7 per game. The winner of the award will be announced on Dec. 6 on ESPN’s SportsCenter. Last year’s Walter Camp recipient was Stanford’s Andrew Luck, now a quarterback for the Indianapolis Colts. 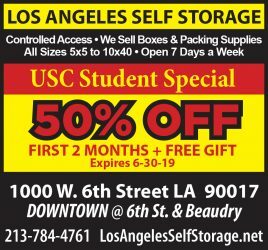 The award was first given out in 1967 to USC alum O.J. Simpson, who won it in back-to-back years. 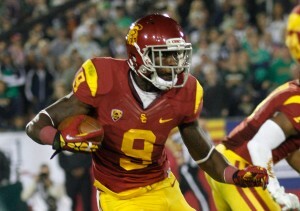 Charles White, Marcus Allen, Matt Leinart and Reggie Bush were also winners representing the Trojans. Four of the five finalists last season ended up with invites to New York as candidates for the Heisman Trophy. Announcements regarding this year’s Heisman, however, have yet to be made. The award ceremony is set for Dec. 8. Meanwhile, the American Football Coaches Association voted Lee to the All-American team alongside Baylor wide receiver Terrence Williams. Five other Pac-12 players were named —Oregon’s Barner, Stanford tight end Zach Ertz and offensive lineman David Yankey, Oregon State defensive back Jordan Poyer and Arizona State defensive end Will Sutton. Former Trojan and current Georgia Bulldogs linebacker Jarvis Jones also qualified for the team. Interestingly, current Heisman frontrunner Johnny Manziel did not earn the quarterback slot, which instead went to Clemson’s Tajh Boyd. In total, the SEC led all conferences with eight players selected to the team. Last season, no Trojans were selected. Lee also recently earned the title of the 2012 Pac-12 Offensive Player of the Year for his performance this season, but his list of accomplishments might soon grow larger — he remains a finalist for the 2012 Biletnikoff Award, given annually to the best wide receiver in the county. Lee appears to be the frontrunner after being the only wide receiver named to the Walter Camp list. Last year, junior wide receiver Robert Woods was named a finalist for the Biletnikoff, which ultimately went to Oklahoma State’s Justin Blackmon. Blackmon won the award two years in a row and now plays for the Jacksonville Jaguars. A Trojan has never won the honor since its inception in 1994. The Associated Press All-American team remains to be seen as well, and wasn’t released until Dec. 14 last season. Woods was a member of the first team, as was former left tackle Matt Kalil. Then-junior Matt Barkley was named to the third team. Great and well-deserved honors for Marquis Lee.